Kings Domain is an area of parklands in Melbourne, Victoria, Australia. It surrounds Government House Reserve, the home of the Governors of Victoria, the Sidney Myer Music Bowl, and the Shrine Reserve incorporating the Shrine of Remembrance. The park was established in 1854, extending the Domain Parklands further north-west, it covers an area of 36 hectares of lawns and pathways set among non-native and native Australian mature trees, a mixture of deciduous and evergreens. In the 19th century the Kings Domain was managed by the Director of the Botanic Gardens, so many of the trees were planted by Baron Ferdinand von Mueller and later by William Guilfoyle. Around the Domain are scattered memorial statues and sculptures, each with their own story. 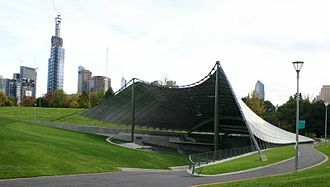 The Sidney Myer Music Bowl - a world standard, architecturally significant, tensile structure and outdoor performance venue. It was officially opened by Prime Minister Robert Menzies on 12 February 1959 with an audience of some 30,000 people, and has remained a popular location for Melburnians. 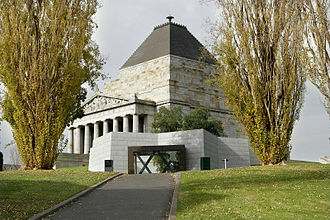 The Shrine of Remembrance is one of the largest war memorials in Australia. It was built as a memorial to the men and women of Victoria who died in World War I, but soon came to be seen as Australia's major memorial to all the 60,000 Australians who served in that war. Governor La Trobe's Cottage is an historic cottage built in 1839 for the first superintendent of the Port Phillip District of New South Wales, Charles La Trobe, and his family. The cottage was constructed out of prefabricated materials imported from England on five hectares of land at Jolimont. It is one of the few surviving examples still standing of prefabricated houses from this period of history and gives an insight into early colonial domestic architecture and living arrangements. In 1963 the cottage was relocated to the Kings Domain as an historical landmark, and is now located backing on to Dallas Brooks Drive. Government House, Melbourne is the office and official residence of the Governor of Victoria. 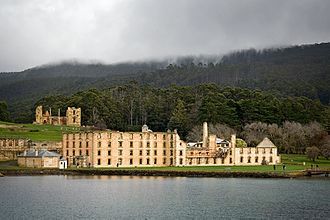 It has also been used as the official residence of the Governor-General of Australia from 1901 to 1930 and from 1934 has been used continuously as the residence of the Governor of Victoria. Built between 1871 to 1876 in the Victorian Period Italianate style, it reflects the extravagant style of the period arising from a booming economy due to the Victorian gold rushes. The Pioneer Women's Memorial Garden was designed by Hugh Linaker in tribute to the European pioneer women of the colony. It features a sunken garden area, with a blue-tiled grotto, which contains a small bronze figure of a woman. The garden was opened in 1935 during the centenary year of the founding of Melbourne. A Memorial for the remains of indigenous people can be seen as a cluster of five painted eucalypt poles, adorned with the spirit people, the Rainbow Serpent and red ribbons, stands above a granite Burial rock honouring the Aboriginal people of Victoria, including the local Wurundjeri. The skeletal remains of 38 Aborigines are buried here, after they were handed over to the Aboriginal Community in 1985 by the Melbourne Museum under threat of legal action by the Koorie Heritage Trust. 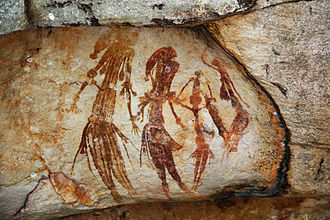 The burial of the remains was performed as a tribute to the people whose long relationship with the land was destroyed with European settlement. The poles were made in 1995 by Megan Evans and Ray Thomas. A memorial to Sir John Monash, as Commander in Chief of the Australian Forces during World War I, is commemorated in a bronze equestrian statue created by William Leslie Bowles. 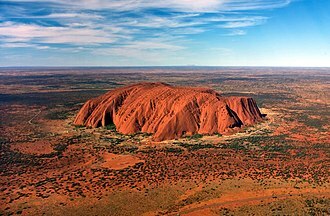 It was unveiled by the Governor-General, William McKell, on 12 November 1950. An interactive sculpture consisting of three bronze bells commemorates the life of Tilly Aston, a blind disability activist who founded the Victorian Association of Braille Writers, and later went on to establish the Association for the Advancement of the Blind. On the sculpture there is an embedded image of Tilly Aston with text in embossed lettering and in braille. The memorial was created by Anton Hasell in 1999. A memorial statue of Sir Thomas Blamey stands on the corner of Government House Drive and Birdwood Avenue. It was sculptured from granite and bronze by Raymond B. Ewers and presented to the city in February 1960. It recognises Australia’s first Field Marshal and his insistence to the British command that Australian forces remain as cohesive units under Australian command. South African War Memorial (Memorial to Fallen Soldiers). A central obelisk with a lion on each of four corners is the memorial for the Australians who died in the South African War of 1899-1902 (Boer War) Sculptored by J. Hamilton and erected in 1904 with members of the 5th Victorian Contingent Victorian Mounted Rifles. The Walker Fountain was donated by Ron Walker, Lord Mayor of Melbourne in 1981. It is located on Linlithgow Avenue and consists of a small lake with hundreds of streams of water, including underwater lights. 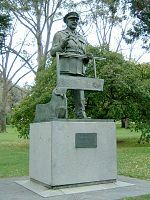 A statue of Sir Edward "Weary" Dunlop is made from bronze, granite and metal spikes from the Burma-Thailand Railway in 1995 by Peter Corlett. Weary Dunlop was known as a courageous leader and compassionate doctor, and showed great leadership whileserving as prisoner of war in Changi prison and on the Burma-Thailand Railway during World War 2. On the steps leading to the sculpture are the names of other doctors who were also POWs at Changi. English Nurse Edith Cavell is remembered in Melbourne with a marble bust erected by public subscription. 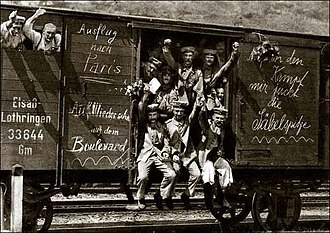 Cavell helped English and French prisoners escape from Belgium during World War I, and was tried by the Germans and executed on 12 October 1915. The bust was sculpted by Margaret Baskerville, and unveiled in 1926. Facing St Kilda Road near the entry to Government House Drive stands a bronze equestrian statue of Lord Hopetoun, more properly called John Hope, 1st Marquess of Linlithgow, also known as the first Governor-General of Australia. The statue is a result of a public subscription and was unveiled on 15 June 1911, by his Excellency Sir John Fuller, accompanied by Prime Minister, Billy Hughes. The King George V Memorial was created by William Leslie Bowles after a public meeting on 6 February 1937 decided to erect a memorial for the late King and launched a public appeal. 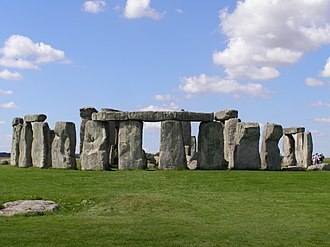 Construction of the bronze, granite and sandstone sculpture was delayed by World War 2 and was completed in 1951. Native Animals : Many native animals live in and visit King's Domain - Brush-tailed and Ring-tailed possums, Tawny Frogmouths, Magpies, Gould's wattled bats, Eastern Freetailed bats and Grey headed flying foxes, Native water rats (Rakali), Kookaburras and several varieties of waterbirds. 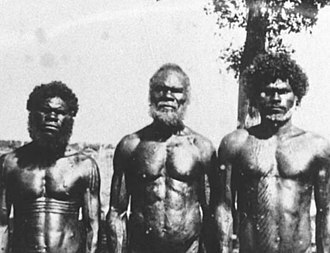 In March 2006, during the Commonwealth Games, an Aboriginal activist group calling itself "Black GST" (Genocide, Sovereignty, Treaty) set up a campsite there in protest against Aboriginal living conditions and the absence of a treaty between the original indigenous inhabitants of the area and the present Government. On 11 April 2006, they were granted a further 30 days to keep their fire going, despite a Supreme Court order that they remove their tents by 2pm on 13 April 2006. The aboriginal protesters have since removed their tents, but are now sleeping in a dilapidated caravan parked in an all day car park. The Melbourne City Council has since started fining them $50 per day for overstaying the time limit. Protection (under a Court order) for the fire expired on 10 May 2006 and shortly after midnight on that date, council workers extinguished it. ^ "Sir Thomas Blamey Memorial". University of Melbourne. Retrieved 29 October 2011. ^ Melway Greater Melbourne Street Directory (Map) (32 ed.). Melway Publishing. 2005. p. Map 1D. § V11. ISBN 0-909439-06-0. Wikimedia Commons has media related to Kings Domain. The Governor-General of the Commonwealth of Australia is the representative in Australia of the Australian monarch, currently Queen Elizabeth II. The Governor-General is appointed by the Queen on the advice of the Prime Minister of Australia, when travelling abroad, the Governor-General is seen as the representative of Australia, and of the Queen of Australia, so is treated as a head of state. The Governor-General is supported by a staff headed by the Official Secretary to the Governor-General, a Governor-General is not appointed for a specific term, but is generally expected to serve for five years subject to a possible short extension. Since 28 March 2014, the Governor-General has been General Sir Peter Cosgrove, from Federation in 1901 until 1965,11 out of the 15 Governors-General were British aristocrats, they included four barons, three viscounts, three earls, and one prince. Since then, all but one of the Governors-General have been Australian-born, as of 2017, only one Governor-General, Dame Quentin Bryce, was a woman. The selection of a Governor-General is a responsibility for the Prime Minister of Australia, the candidate is approached privately to confirm whether they are willing to accept the appointment. The prime minister advises the monarch to appoint his nominee. This has been the procedure since November 1930, when James Scullins proposed appointment of Sir Isaac Isaacs was fiercely opposed by the British government, Scullin was equally insistent that the monarch must act on the relevant prime ministers direct advice. Both of these appointments had been agreed to despite British government objections, despite these precedents, George V remained reluctant to accept Scullins recommendation of Isaacs and asked him to consider Field Marshal Sir William Birdwood. However, Scullin stood firm, and, on 29 November, the King agreed to Isaacss appointment and this right to not only advise the monarch directly, but to expect that advice to be accepted, was soon taken up by all the other Dominion prime ministers. This, among other things, led to the Statute of Westminster 1931, having agreed to the appointment, the monarch permits it to be publicly announced in advance, usually several months before the end of the current Governor-Generals term. During these months, the person is referred to as the Governor-General-designate, the actual appointment is made by the monarch. Governors-General have during their tenure the style His/Her Excellency the Honourable, since May 2013, the style used by a former Governor-General is the Honourable, it was at the same time retrospectively granted for life to all previous holders of the office. From the creation of the Order of Australia in 1975, the Governor-General was, ex officio and Principal Companion of the Order, and therefore became entitled to the post-nominal AC. In 1986 the Letters Patent were amended again, and Governors-General appointed from that time were again, ex officio, until 1989, all Governors-General were members of the Privy Council of the United Kingdom and thus held the additional style the Right Honourable for life. 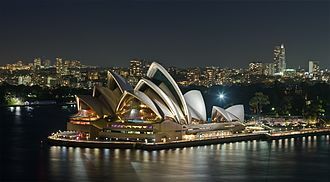 Architecture is both the process and the product of planning and constructing buildings and other physical structures. Architectural works, in the form of buildings, are often perceived as cultural symbols. 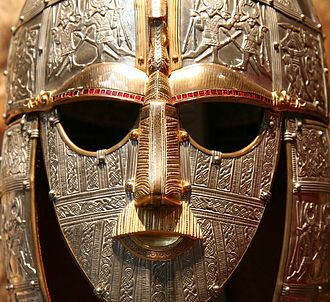 Historical civilizations are often identified with their surviving architectural achievements, Architecture can mean, A general term to describe buildings and other physical structures. The art and science of designing buildings and nonbuilding structures, the style of design and method of construction of buildings and other physical structures. A unifying or coherent form or structure Knowledge of art, technology, the design activity of the architect, from the macro-level to the micro-level. The practice of the architect, where architecture means offering or rendering services in connection with the design and construction of buildings. The earliest surviving work on the subject of architecture is De architectura. According to Vitruvius, a building should satisfy the three principles of firmitas, venustas, commonly known by the original translation – firmness, commodity. An equivalent in modern English would be, Durability – a building should stand up robustly, utility – it should be suitable for the purposes for which it is used. Beauty – it should be aesthetically pleasing, according to Vitruvius, the architect should strive to fulfill each of these three attributes as well as possible. 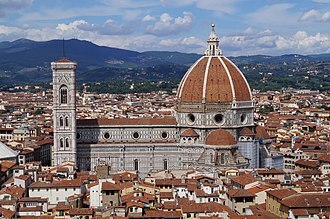 Leon Battista Alberti, who elaborates on the ideas of Vitruvius in his treatise, De Re Aedificatoria, saw beauty primarily as a matter of proportion, for Alberti, the rules of proportion were those that governed the idealised human figure, the Golden mean. The most important aspect of beauty was, therefore, an inherent part of an object, rather than something applied superficially, Gothic architecture, Pugin believed, was the only true Christian form of architecture. The 19th-century English art critic, John Ruskin, in his Seven Lamps of Architecture, Architecture was the art which so disposes and adorns the edifices raised by men. That the sight of them contributes to his health, power. La Trobe was a strong supporter of religious and educational institutions. La Trobe was the nephew of British architect Benjamin Henry Latrobe and he was educated in England and spent time in Switzerland and was active in mountaineering, he made a number of ascents in the Alps 1824–26. La Trobe wrote several books describing his experiences, The Alpenstock, Or Sketches of Swiss Scenery and Manners and The Pedestrian. In 1832 he visited the United States along with Count Albert Pourtales and he wrote The Rambler in North America and The Rambler in Mexico. On 16 September 1835 he married Sophie de Montmollin in Berne and their first child, Agnes Louisa de La Trobe, was born on 2 April 1837 in Switzerland. 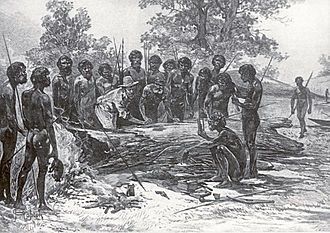 In 1837 La Trobe was entrusted with a government commission in the West Indies, on 4 February 1839 he was appointed superintendent of the Port Phillip District of New South Wales though he had little managerial and administrative experience. 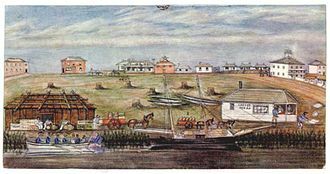 La Trobe sailed into Sydney on 26 July 1839, with his wife and 2-year-old daughter, the La Trobes went on to Melbourne on 1 October. Governor Gipps was disturbed when he heard about it, La Trobe, convinced him that he had acted innocently. On the land he erected his home, which has preserved and is called LaTrobes Cottage. Melbourne had a population of around 3,000 at the time and was rapidly expanding, La Trobe commenced works to improve sanitation and streets. A Separation Association had been formed in 1840 wanting Port Phillip District to become a separate colony, in 1841 La Trobe wrote to Gipps, asking him to visit Melbourne to form his own opinion on the separation question. La Trobe did not actively campaign for separation, content that Earl Grey had included separation in the plan for the colonies. La Trobe acted as lieutenant-governor of Van Diemens Land for four months in 1846-47, by 1851, Port Phillip district had gained separation from New South Wales, becoming the colony of Victoria, and La Trobe was lieutenant-governor for three years - a position he held until 1854. Soon after separation gold was discovered at several locations in Victoria and he was commonly referred to as Charley Joe, and by extension, any government officials or policemen were called joes. A toilet is a sanitation fixture used for the storing or disposal of human urine and feces. In developed countries, different forms of flush toilets are common. These are connected to a system in most urban areas. In many developing countries, especially in areas, dry toilets such as pit latrines. Dry toilets are usually placed in outhouses, i. e. not inside the dwelling, in many countries, private homes are designed with the flush toilet and the bath or shower in the same room, the bathroom, to simplify plumbing and reduce cost. Other cultures find this insanitary, and have one room for body-washing, public toilets are installed where their use is expected on a permanent basis, while portable toilets may be brought in for large but temporary gatherings. Chemical toilets are used in various contexts, such as passenger trains. Serious waterborne diseases such as cholera and diarrhea occur when open defecation or poor sanitation permits human waste to pollute water supplies, sanitation has been a concern from the earliest stages of human settlements. The Indus Valley Civilization is particularly notable for its extensive sanitation works, for the most part, early cities emptied their waste into rivers or seas manually or via open ditches. 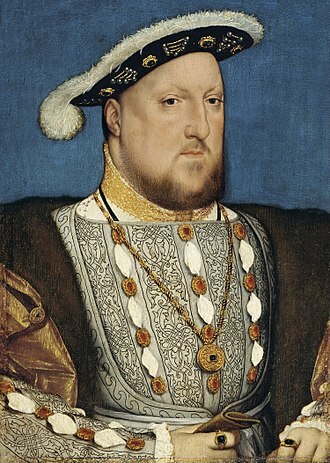 Sanitation in ancient Rome was notably advanced, as were some of the reredorters of medieval monasteries, a precursor to the modern flush toilet system was designed by John Harington in 1596 but did not become common until the late 19th century. 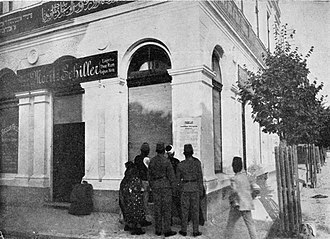 Even London, at time the worlds largest city, did not require indoor toilets in its building codes until after the First World War. A typical flush toilet is a ceramic bowl connected on the up side to a cistern that enables rapid filling with water, when a toilet is flushed, the sewage should flow into a septic tank or into a system connected to a Sewage treatment plant. However, in countries, this treatment does not happen. The water in the bowl is connected to a pipe shaped like an upside-down U. One side of the U channel is arranged as a tube longer than the water in the bowl is high. La Trobes Cottage is a historic cottage in Melbourne, Australia, built in 1839 by the first Superintendent of the Port Phillip District of New South Wales, Charles La Trobe, and his family. The cottage was constructed out of prefabricated materials imported from England on 50,000 square metres of land at Jolimont, the cottage is listed on the Victorian Heritage Register for its historical and architectural significance. It is one of the few surviving examples still standing of prefabricated houses from this period of history and gives an insight into early colonial domestic architecture, personal effects of La Trobe and his family are still contained in the cottage. The dining room added by La Trobe is believed to be the oldest surviving structure built in Melbourne, the architectural style is described as Pre-separation colonial Georgian. John Sharp, in a letter to the editor of The Argus of May 1888, Sharp said he had two photographs of the building, one of which he sent to the Australian Sketcher in the hope that some day it may be useful. In June of that year, the Australian Sketcher published an illustration based on Sharps photograph and they published another illustration based on a photograph provided by its owner H. W. In November of that year the Australian Sketcher wrote that Governor Latrobes cottage was owned by Messers, alfred Fenton and Sons while the quaint old place which Bishop Perry occupied. Was some time ago pulled down to room for the residence of Mr. Sharp. This different cottage at the corner of Wellington-parade and Jolimont-terrace had been the home of Childers, in 1914, the cottage was the property of Messers. Bedggood and Company, who had their boot manufacturing company on an adjoining Jolimont block and it was proposed that the cottage, which was in an advanced state of decay, be demolished to extend the Bedggood premises. Daniel Bedggood, promised the Government whatever portion of the building that was desired as a relic, pencil sketches of the cottage and its grounds from the era when the La Trobe family were in residence were donated by Charles La Trobes grandchildren to the state of Victoria in 1924. The sketches were the work of Edward Bateman, Charles La Trobes cousin, that year The Argus newspaper reproduced one of Batemans sketches adding that until recently the remains of the cottage were still standing at the rear of the factory of Bedggood and Co. Two watercolours dated 1842 or 1844 depictions of the cottage were donated by another La Trobe grandchild in 1934, thunderstorms were reported to have damaged the cottage in 1935 which was already weakened by senile decay in its ninety-fifth year. Rain had severely damaged the ceiling of the old banqueting hall, contractors had concerns another heavy storm might sent the tall brick chimney crashing down. H. L. Bedggood of owners Bedggood and Co, in March,1942 it was reported that the cottage was to be demolished to make way for an air raid shelter that would accommodate 350 people. The following month a portion of the cottage was taken down, Mr. H. L. However, if possible the front portion of the cottage would be retained. The bricks from the demolition were turned into doorstops by Mrs. H.
Braille /ˈbreɪl/ is a tactile writing system used by people who are blind or visually impaired. It is traditionally written with embossed paper, braille-users can read computer screens and other electronic supports thanks to refreshable braille displays. 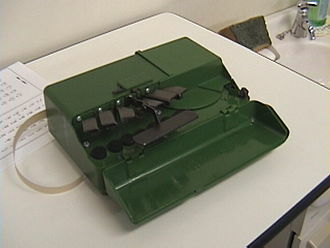 They can write braille with the slate and stylus or type it on a braille writer, such as a portable braille note-taker. Braille is named after its creator, Frenchman Louis Braille, who lost his eyesight due to a childhood accident, in 1824, at the age of 15, Braille developed his code for the French alphabet as an improvement on night writing. He published his system, which included musical notation, in 1829. The second revision, published in 1837, was the first binary form of writing developed in the modern era, Braille characters are small rectangular blocks called cells that contain tiny palpable bumps called raised dots. The number and arrangement of these dots distinguish one character from another, since the various braille alphabets originated as transcription codes of printed writing systems, the mappings vary from language to language. Braille cells are not the thing to appear in braille text. There may be embossed illustrations and graphs, with the lines either solid or made of series of dots, bullets that are larger than braille dots, a full Braille cell includes six raised dots arranged in two lateral rows each having three dots. The dot positions are identified by numbers from one through six,64 solutions are possible from using one or more dots. A single cell can be used to represent a letter, punctuation mark. In the face of screen-reader software, braille usage has declined, in Barbiers system, sets of 12 embossed dots encoded 36 different sounds. It proved to be too difficult for soldiers to recognize by touch, in 1821 Barbier visited the Royal Institute for the Blind in Paris, where he met Louis Braille. Brailles solution was to use 6-dot cells and to assign a specific pattern to each letter of the alphabet. At first, braille was a transliteration of French orthography, but soon various abbreviations, contractions. Eucalypt forests in Victoria. Australia's tree flora is dominated by a single genus, Eucalyptus, and related Myrtaceae. 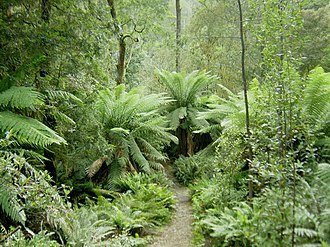 The Tasmanian rainforest is considered a Gondwanan relic. Scrubland with Xanthorrhoea following bushfire. A eucalyptus-dominated forest near Prospect Creek in Sydney. The dedication ceremony for the Shrine of Remembrance. 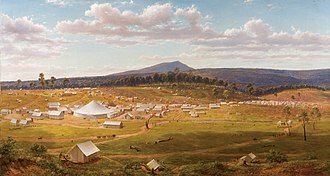 Over 300,000 people were in attendance, approximately a third of Melbourne's population at the time. 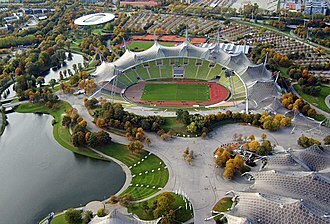 The Olympiastadion in Munich makes extensive use of tensile roofing structures. The Melbourne skyline, seen across Port Phillip. Cliveden Mansions in 1887, Melbourne's largest terrace house development was demolished in the late 1960s to make way for the high-rise Hilton Hotel. Osborne House, Isle of Wight, England, built between 1845 and 1851. It exhibits three typical Italianate features: a prominently bracketed cornice, towers based on Italian campanili and belvederi, and adjoining arched windows. Government House, Melbourne. The Hall decorated in 19th-century Italianate style. Cliveden: Charles Barry's Italianate, Neo-Renaissance mansion with "confident allusions to the wealth of Italian merchant princes." Braille on a box of tablets. The raised Braille reads 'plavix'. 1st Division Headquarters at Anzac, 3 May 1915. Blamey is in the foreground with his back to the camera. 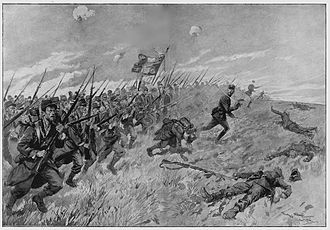 The position was exposed to shrapnel fire and Major John Gellibrand was wounded there. 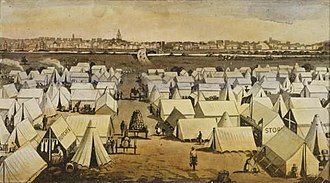 Ballarat's tent city just a couple of years after the discovery of gold in the district. Oil painting from an original 1853 sketch by Eugene von Guerard. Boathouses in Alexandra Gardens from across the Yarra River. Bust of Mueller at the Royal Botanic Gardens, Melbourne. Linaker's style of using vertical trees is evident in his plantings, such as at the Maroondah Reservoir Park. La Trobe's Cottage in Kings Domain.